(Newser) – A video clip of Saudi Arabia's top cleric saying that the game of chess is "forbidden" in Islam because it wastes time and leads to rivalry and enmity among people has provoked heated debate, and widespread criticism, among Arabic Twitter users. The clip was shared on YouTube in December, gaining traction in recent days on social media. Some Twitter users mocked Grand Mufti Sheikh Abdulaziz Al Sheikh, saying chess is an intelligent game and that is why conservative clerics decry it. Others defended his religious advice, saying that many other Islamic scholars have also warned that the game can be addictive and cause people to lose focus from their daily prayers and remembrance of God. Similarly, Shiite Iran's Grand Ayatollah Ali al-Sistani previously declared that chess is religiously prohibited because it could be used for gambling. 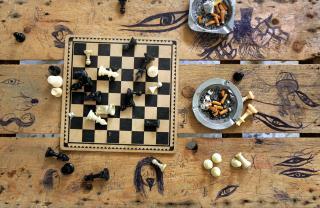 did anyone notice the "graffiti" around the chess board. The caption said the picture was from somewhere in Southern Lebanon. Strange that the drawings are of womens eyes, womens faces and their hair. Not really what you would think men playing chess would doodle. This looks more like sexually repressed teenagers and not a table where men would play. Read once that to become an Imam, its pretty much the same process as people do from ads in the back of Rolling Stone to become ordained ministers. So if you see the word Moslem cleric, don't give it very much consideration. Its kind of like your kids putting on a darth vader outfit and calling themselves Jedi masters.